Kirtland’s Warbler. Image: Joel Trick, U.S. Fish & Wildlife Service. 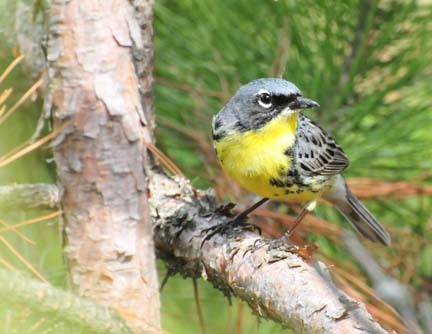 But the core population of Kirtland’s warblers is in the northeastern Lower Peninsula of Michigan, near Grayling, said Bill Rapai, chair of the Kirtland’s Warbler Alliance Board of Directors. The volunteer board raises awareness of the Kirtland’s warbler and the conservation programs necessary for the species’ survival. A small number of birds can also be found in Ontario, Canada. The biggest reason the species is endangered is that it requires a specific habitat, Rapai said. There are too many people and too many structures to simply let fires burn, Rapai said. But without them, new jack pines don’t grow, and the birds have nowhere to nest. So conversationalists cut down the trees and plant new ones. While the Michigan Department of Natural Resources is aware of the playback project in Wisconsin, it will not be implementing it. In April 2018, the U.S. Fish and Wildlife Service proposed to remove the Kirtland’s warbler from the endangered species list. A decision is expected by spring.